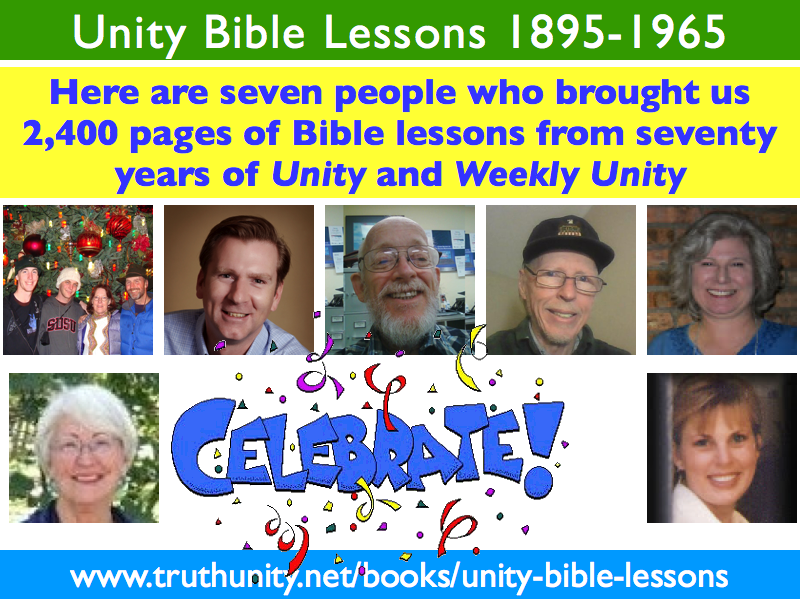 What are Unity Bible Lessons? They are 2,400 pages of Unity's teachings on the Bible, published in Unity magazine and Weekly Unity between 1895 and 1965. The collection is the most complete metaphysical Bible resource available today. The originals are in five large binders in the Unity Archives. About half of the 1190 chapters of the Bible have interpretations. As might be expected, there are no interpretations for the Song of Solomon or the Book of Lamentations. Research on this project began in 1951. Material is compiled from WEEKLY UNITY magazine from 1916 to and including December 1951. A few were used from 1952, and added later. When issues of WEEKLY UNITY were not available, the lesson was copied. UNITY magazine was used when there was no interpretation In WEEKLY UNITY, when interpretation was incomplete, or as supplementary material. When more than three interpretations were available on a scripture, those written in the 1930's were used, preferably 1935-1939. Lessons bear the Sunday date. Up to 1942 the magazine in which they appeared bore the date of the preceding day. Scriptures appearing out of order as to date or chronologically were added after the book was made up. Material was used from references listed in the Bible Index and the cards. Did not check the magazines for omissions. Roland suggested that an index of all references be listed at the head of each chapter for the purpose of making further research if desired. Why not just use the Metaphysical Bible Dictionary? They are organized by Bible chapter, not by Bible term, person or place. So they are a spiritual commentary on scripture, rather than being a dictionary of spiritual terms. A dictionary is useful in helping us to understand a verse, but a commentary is most useful in helping us understand the broader meaning of a passage. They are more complete than the Metaphysical Bible Dictionary. There are hundreds of profound interpretations that never got into the Metaphysical Bible Dictionary. The Preface to the Metaphysical Bible Dictionary says "In this dictionary, Mr. Fillmore's interpretations, which have appeared in Unity magazine and in other Unity literature from time to time, have been used." So the MBD drew from the Unity publications, and there is more content in the publications than in the MBD. They contain commentary that was published after the Metaphysical Bible Dictionary was printed. After the MBD was printed in 1931, the world encountered the repeal of Prohibition, the stress of the Great Depression, the tragedy of World War II, and the threat of nuclear war. Commentaries published after 1931 are set in the context of these events. Who transcribed these 2,400 pages? LuAnn Stevens - "Spiritual seeker, wife, mother and a really fast typist!" Dan Beckett - "I'm so grateful to have been able to contribute to this project. I think it's important that we preserve these interpretations and I'm happy to know they will be accessible to others so much more easily now." Tom Schulte - "A truth student for many years and have enjoyed many mountaintop experiences." Lloyd Kinder - "My home base is Golden Eagle, IL. I'm mostly 5th generation German-American, with some French, English, Scotch-Irish and Osage thrown in. My family did farming and later started a restaurant, unfortunately not organic. I followed "Faithism" for 20 years and associated with Quakers. When I moved to Indy recently I started attending Unity. I enjoyed transcribing the Unity lessons, partly because of learning the interesting philosophy, esp. the importance of "thought control", and because it was like doing a jigsaw puzzle, which I enjoy. Adobe Reader did a fairly good job of reading the text of the lessons, so I only had to type about a third or so of it to fill in and make corrections. I write quite a bit online. Two of several websites I'm involved in are http://BILIB.webs.com and http://CodaPlus.webs.com." Jennifer Keating - "I am an independent minister in Dallas, TX. I have been a student of New Thought for some years, gleaning Truth principles from Unity, Religious Science and Divine Science. In addition to doing weddings, I am minister of Divine Life New Thought Church, www.dlntc.org." Tracie Louise - "I am a landscape/nature photographer living in Queensland Australia. My motto is 'Seeing the Beauty in All Things" and my mission is to inspire others to seek the beauty and meaning in their own lives... and perhaps share a little of myself along the way.'" How can you access the Unity Bible Lessons? These lessons are available to you and other Bible students and scholars worldwide, for free. Since the volunteers have transcribed the pages, the text has now been crawled by Google and Bing, and Unity's priceless teachings on the Bible now come up in search engines. Going to a Bible chapter here on TruthUnity and then clicking on the link in the upper right that says "Metaphsical Interpretion of..."
Entering a person, place or term in the search box at the top of this page and then selecting the results on the tab marked "MBI" (Metaphysical Bible Interpretation). Thank you, Analea Rawson, for photcopying these 2,400 pages out of the Unity Library so many years ago, and for lending me your treasured binders. May editors of church newsletters all over the world copy and paste this graphic into their Sunday bulletin. And may Metaphysical Bible Interpretation flourish in Unity.